(Bloomberg Opinion) -- Foreign investors are tiptoeing into China’s bond market just as defaults are climbing. That means they’ll need even more help separating the wheat from the chaff – too bad international ratings firms can’t step up. In January, S&P Global Inc. became the first major rating company to gain independent entry into China after its Beijing-based unit won approval to start scoring local bonds. Moody’s Investors Service Ltd. and Fitch Ratings Inc., which have both opened wholly owned subsidiaries in the country, are awaiting permission to begin their businesses. The trouble is that, once in China, global ratings firms won’t be much better than their local rivals. For one thing, their grading systems will bear little resemblance to those used in most other parts of the world. S&P said its standards and methodology will be tailored to “fit the local situation,” according to a document last year, much like in other emerging markets including Turkey, Israel and Argentina. But in those countries, ratings are “mapped,” which means investors can effectively translate region-specific scores to global ones. In China, neither S&P nor Fitch will extend such a courtesy. So, foreign investors will have little way of assessing how the creditworthiness of mainland businesses, local governments and other borrowers stacks up against various issuers around the world. This presents a dilemma for global money managers and other players from abroad. China has taken a number of steps in recent years to court their cash and make investing onshore easier. In July 2017, Beijing permitted foreign companies to buy mainland bonds through brokerages in Hong Kong via the Bond Connect channel, giving investors a new route beyond quotas. The country has also ticked off a handful of items from the list of global investors’ grievances to secure inclusion into the Bloomberg Barclays Global Aggregate Index. Starting in April, yuan-denominated government and policy-bank bonds will be phased in gradually, according to Bloomberg LP, the parent of Bloomberg News. That could translate to around $150 billion of inflows, HSBC Holdings Plc wrote. All of this is happening as defaults continue to climb, reaching a record 119.6 billion yuan in 2018 and quadrupling from last year. Part of that is a good thing: The government is taking steps to unwind expectations that it’ll always rescue companies in peril. (Before 2014, China didn’t allow any defaults.) 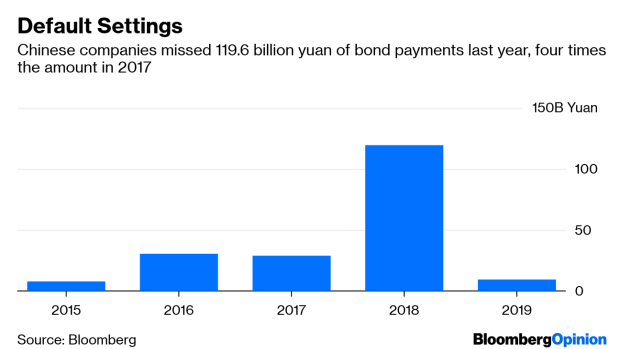 Yet with two large Chinese borrowers missing payment deadlines, and the economy slowing, there are questions about the steadfastness of President Xi Jinping’s promise to support private enterprises, which have seen the bulk of defaults. A local investor will probably have the insight to suss out which Chinese companies are riskier than others. But foreigners may not have the same intuition. As bond defaults rise, having a road map has never been so important. (1) Dagong was banned from assessing bonds for a year in August for offering consulting services to borrowers with high fees.